Please CALL US!! We are happy to help you on the phone!! 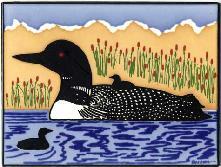 SHOWN BELOW IS ONE OF OUR "SPECIAL EDITION TILES"
WL-681 Loon with Chicks 6" x 8" Special Edition $54.95 each FREE SHIPPING** BEAUTIFULLY GIFT BOXED!! 1. We offer a complimentary protective backing and secure hanger on each tile. This allows you to easily hang these hand painted art tiles, and make attractive groupings as decorative wall plaques. These highly collectable tiles are beautifully boxed and make TERRIFIC GIFTS!! 2. Install these beautiful handpainted art tiles in your kitchen as a tile back splash, tile countertop, or, as bathroom tile, or fireplace tile, for an exquisite and significant addition to your home! !